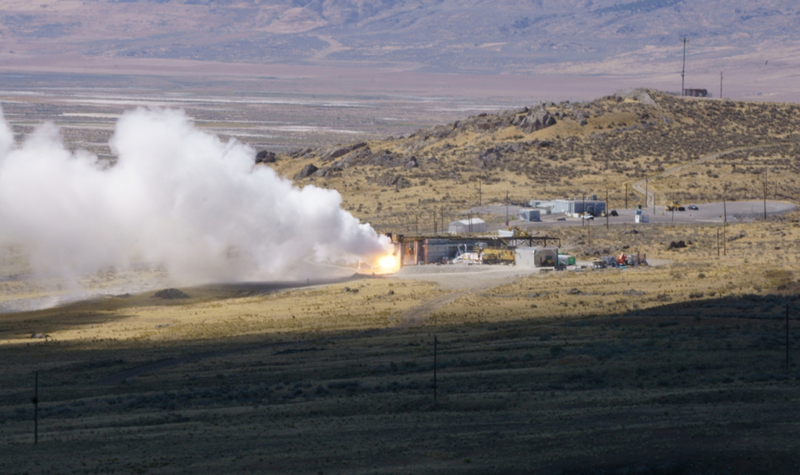 A new milestone for the future of United Launch Alliance’s rockets was conducted by Northrop Grumman Innovation Systems (NGIS) on Thursday, when the first GEM-63 motor was test-fired for 110 seconds during the QM-1 firing at the NGIS testing facility in Promontory, Utah – sending 373,000 lbs of thrust along with bright fire, loud noise and vibration into the sunny desert sky. This test was the first of two qualification firings required before the GEM-63 is used in operational missions on the Atlas V, as a “drop in” replacement for the current Aerojet Rocketdyne AJ-60A boosters. The GEM-63 fired was conditioned to a temperature of 40 degrees Fahrenheit to test the motor’s performance in cold conditions. Ballistic, insulation, nozzle plug, igniter insulator performance and ablative nozzle erosion measurements were taken with over 160 instrumentation channels, and these were the main qualification objectives. Additional objectives included vibration, acoustic, and heat data, motor axial elongation and radiative heat monitoring data. This firing would take 110 seconds due to the cold conditioning, whereas it would normally fire for around 90 seconds (84 for the GEM-63, 94 for the XL). The cold conditioned test was done first as it is the most taxing test of the motor and its systems, including the fixed, non-steerable nozzle. The next test (QM-2) is a risk mitigation test for the US Air Force and will be hot conditioned to 90 degrees Fahrenheit. It is currently set for early December 2018, and if all goes well the first Atlas V launch with GEM-63’s would take place in July 2019 with the STP-3 mission, which will use five boosters on the Atlas V.
The GEM-63XL to follow will be the version that flies on the ULA Vulcan rocket, and it is set for its first test firing in October 2019, with its first launch to be determined. The GEM-63XL at 864 inches in length is longer than the current GEM-63 tested today (791 inches in length) and the XL will use a pointed nosecone as opposed to the blunt curved nosecone that is currently used on the AJ-60A and that will be used on the GEM-63. The XL’s exit plane diameter is 56 inches and its propellant mass is 105,900 lbs as opposed to a 54 in exit plane and 97,500 lb propellant mass for the GEM-63 tested today. 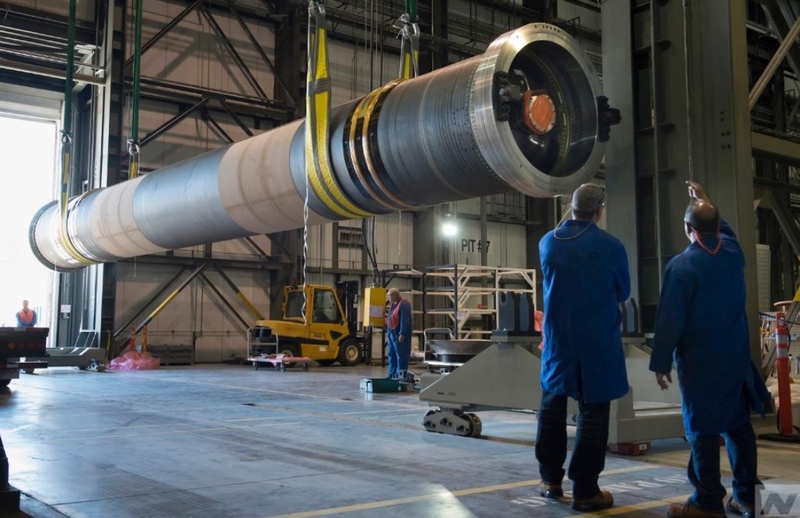 The GEM-63 is not only three inches wider than the GEM-60 (used on the Delta IV), it is also much longer, and the GEM-63XL (the first case of which has already been spun) is the largest monolithic composite solid rocket casing that NGIS has ever produced. The biggest challenge that the widened and lengthened GEM booster posed for NGIS was building a new casting pit which was required due to the length of the booster. The casing is spun at the NGIS facility in Clearfield, UT, which is south of Promontory and Ogden, and other prep work is done at the Promontory and Bacchus facilities (in Magna near the Oquirrh Mountains, well south of Clearfield) before the final assembly is done and the rocket booster is sent on its way to the launch site, using a large wheeled transporter as part of the process. The GEM-63 and GEM-63XL have been developed as a response to SpaceX’s disruption of the space launch market, to help lower costs and increase performance for the ULA Atlas and Vulcan launch vehicles, as ULA and others need to control costs to stay competitive in the new era. “Northrop Grumman has been supplying solid propulsion motors for a variety of launch vehicles since 1964,” said Scott Lehr, president, flight systems, Northrop Grumman. Sixty GEM-63/63XL rockets have been ordered, 30 for each program. One booster per day will be shipped to launch sites when the process is in full swing, and production has already begun. The Northrop Grumman Innovation Systems unit and its Propulsion Systems Division have drawn on a heritage of six decades of work on solid rocket motors ranging from the Sidewinder to the Minuteman, the Shuttle, the Castor and earlier GEM graphite-epoxy motors and is one of two solid rocket production companies in the United States now. 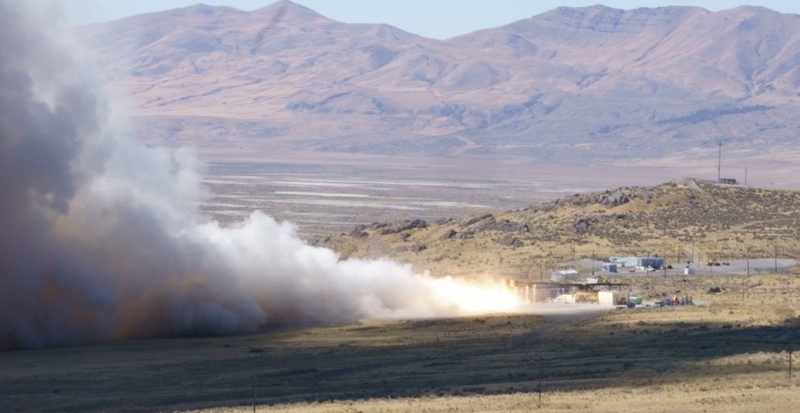 The GEM-63 and GEM-63XL are the latest solid rocket motors to be built and tested at the Promontory facility in the Utah desert, and these boosters will help power Atlas and Vulcan launch vehicles into the next decade.